The completely-redesigned Half Dome finally updates the venerable old classic of the climbing world into a sleek, modern helmet that is competitively light. It looks better as well, if you care about such things, and in nearly all conditions and contexts you can imagine, the Half Dome should prove to be an excellent choice, be it for big mountain winter expedition in the Karakoram or just a little scrambling around on your favorite local peak. Black Diamond has also tweaked the fit wheel so you get finer steps, allowing better fit control. You of course get headlamp clips so you can climb with your light on—Black Diamond says these are the most secure clips on the market. With a weight of 10 ounces in the small/medium size, the Half Dome is certainly lighter than its earlier generations, if not quite so light as today's lightest helmets. As with previous Half Dome models, the helmet is weighted toward durability and impact safety, rather than lightest-of-the-light minimalism. Ventilation has been improved, but the Half Dome remains a more closed design, probably not the best choice if temperatures are going to be extremely hot. On the other hand, the Half Dome's modest vents make the helmet more suitable for winter climbing or otherwise cold/stormy weather. You'll likely better appreciate the Half Dome's solid top in pouring rain, or blizzards, or dust storms. Ski mountaineers may also prefer the Half Dome's smaller vents for warmth against icy winter winds, and note also that the Half Dome's smaller vents are less dangerous when skiing through trees, as you're less likely to spear a branch and get yanked by your neck to an abrupt halt. For price, versatility, and durability, it's hard to argue with the Half Dome, new or old. 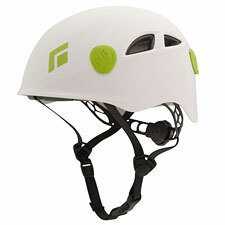 It's a fine choice as an all-around climbing helmet—and a top pick for harsh conditions and expedition use.